John Waugh born at Kirkside Sutherlandshire died at Yarrows Trumster 13th June 1914 aged 56. Son Farquhar Waugh died 2nd February 1914 aged 25. 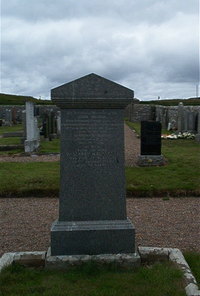 Wife Margaret Macgregor died at Ulbster 9th January 1934 aged 73.